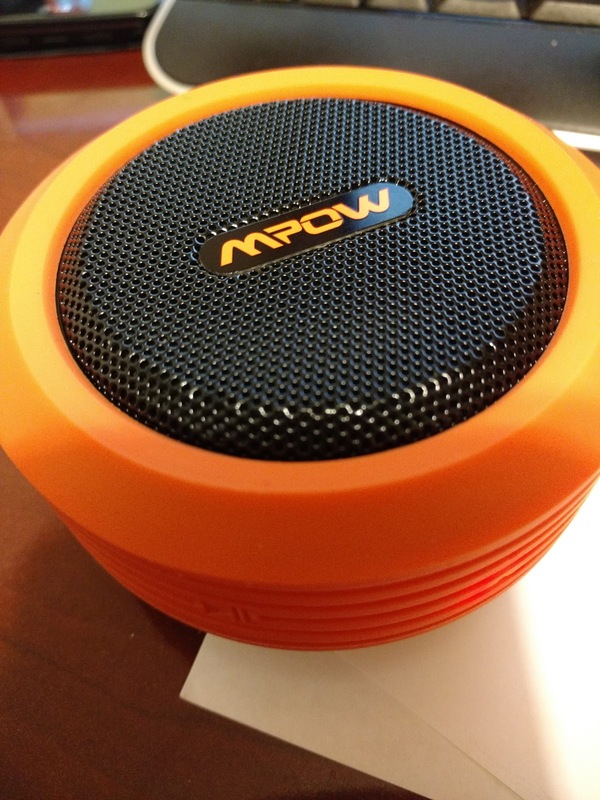 So, recently I wrote a couple reviews about items to help you out with on your trip (car mount, car charger) ... but now that you're at your destination, you're going to need some tunes to have a good time. I love music. I love having get togethers and having music in the background. Something about it. Doesn't have to be the focal point, but ... there. 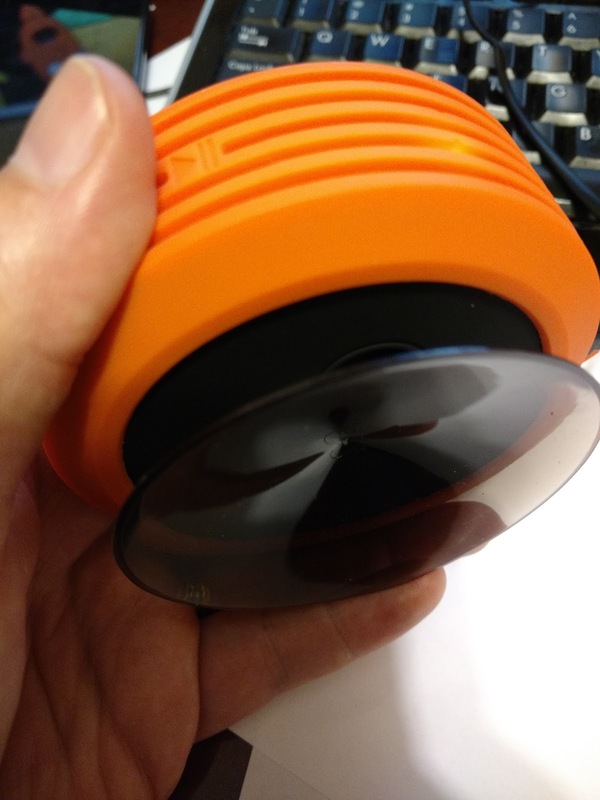 With this speaker you have the option of using the suction up and placing it anywhere to play your music. And this thing STICKS. Probably one of the few complaints I have over it. So if it's on, it'll take some doing to get it off. 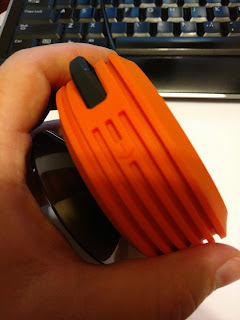 There's no little tab thingie for you to lift to help break the seal so you can get it down. Where we were, we put it on a window a bit away from us, and it allowed it to be high enough to really travel. The 5W really helped push it as well... we were in a smaller cafeteria but it definitely filled the room. We had to move it to the window because having it on the table with us got to be a bit loud (sure we could have turned it down I guess... but then we wouldn't have got to play with the suction cup). Play time is somewhere around the 8hr range, but I never let it go that long. It does have some controls, which I found a little awkward. If you look at the device over the top, and think of it like a clock, the play button is at the 7 o'clock spot. Back/Vol- is about the 11 o'clock, with Forward/Vol+ is about the 2 o'clock (but the arrow looks like it's pointing the opposite way, so I would get confused). Power is 4 o'clock (and it was just in a spot that meant I usually hit it accidentally) - I would have hoped it was somewhere aside from the control buttons... say, on top of the unit. I did notice some times that the long press for Vol -/+ was a little finnicky and ended up skipping/prev the track instead. That aside, it does have a really durable feel with a that soft rubbery texture. You can tell that this is meant to be taken outside as it has a carabiner clip for you to attach it something on the go. Overall, this is a nice small enough device to be taken anywhere, yet pack enough of a punch to get any get-together pumping (really... I can't stress that enough ... I was thoroughly impressed with what it could push out).